Our team of experts can’t wait to show you how to crochet. 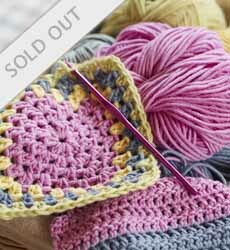 Whether you’ve never even held a crochet hook or simply want to improve your technique, with our help you’ll soon be able to follow the fabulous patterns you’ve seen in Woman’s Weekly and online shop. Tickets will be allocated on a first-come, first-served basis. Woman’s Weekly has the right to change the itinerary of the day. Please note, tickets to this event are non-refundable, unless it is cancelled or postponed. A guest-list policy will be in operation at the event. Shortly after purchasing tickets, you will receive confirmation: this is your ticket to the event, so please retain it for future reference. Please bring a note book and pen and feel free to bring your own digital devices. Workshops run from 10am-4.30pm. The workshop will be held at our office at Time Inc. (UK), Blue Fin Building, 110 Southwark Street, London SE1 0SU. The office is within walking distance of London Bridge, Waterloo, Waterloo East, Blackfriars and Southwark stations. There is a canteen on site, where you can buy a cooked meal or sandwiches to eat on our roof terrace if the weather is fine. There are also local sandwich bars or you may bring your own lunch.